Looking for Employees? Check out our Employer Resources! All students and alumni are eligible to use the Hawkeye Job Board to upload resumes, search for, and apply for jobs. Start by logging into your Hawkeye Job Board account to begin your job search. More full-time, part-time, and internship opportunities posted daily! 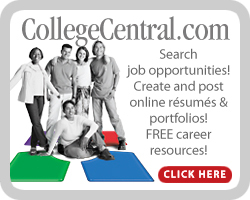 Also see our Web Resources for more job search options. Take a break from searching for jobs to clear your thoughts and reevaluate your plan. Explore volunteering opportunities. Not only are you lending a helping hand, but you can use current skills and gain new ones in the process. It is also a chance to network in the community. Find someone who can serve as your mentor or sounding board. With that person, you should be able to vent your frustrations as well as generate new ideas and goals. Stay healthy by eating well and exercising. A positive body leads to a positive mind.